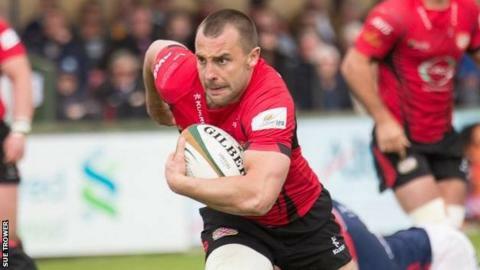 Former Jersey captain Nicky Griffiths has left the Championship club with immediate effect for "family reasons". Griffiths had six months left to run on his contract, which he signed in the summer of 2013. "It's been a great journey, and I'm disappointed to be leaving the island," he said in a statement. "I'm grateful that the club have been supportive in agreeing my release so that I'm able to return to Wales. "I've loved my time in Jersey, and it's become a real home-from-home. There have been some great moments, including winning National One and the final day of last season when we won at Bedford, and I'll have some special memories of my time here," he added. The former Cornish Pirates man, who previously played for Wales at sevens and junior levels, scored 13 tries in 58 games for the island side. But ex-Northampton scum-half Ryan Glynn has been preferred this season, with Joel Dudley deputising, limiting Griffiths to just two league starts. Griffiths suffered a hand injury in October, with his last appearance being as a replacement in the that month. "Nicky has played a major part in what the club has achieved during his time here and we'll be sad to see him go," said Jersey chairman Bill Dempsey. "But personal matters have arisen which have left him wanting to return home to his family - we respect his position and he departs with our best wishes for the future."